Those weren’t the opening lines from some loser liberal commentator. They were from the Associated Press. The editors at AP at some point realized that their job wasn’t just to report what newsmakers say but also whether what they say is false. In the speech in question, AP reported, Trump said a whole bunch of things that weren’t true: like the fact that he wouldn’t benefit from the moist and scaly tax monster slithering through Congress. “This is going to cost me a fortune, this thing, believe me,” he told the crowd. Oh, yeah. In fact, Trump could benefit by more than $1 billion, according to an NBC News analysis. The alternative minimum tax, abolished in this bill, is the only reason Trump paid anything at all in the only year we know anything about if or what he paid in taxes. Then there’s the break he and his heirs would get from an end to the estate tax. Yes, the Republican tax plan borrows a trillion against America’s future to give billionaires and multinational corporations big tax breaks. At the same time, one-third of Americans would see no benefit whatsoever or even pay more. What a deal. Yes, with the tax bill, the Lyin’ King finally has a triumph to announce from Pride Rock. Hear him roar. Unfortunately for him, some lies are catching up with His Majesty. Consider one trivial falsehood told by Mike Flynn to the FBI, one which neatly dovetails with lies Trump repeatedly has told Americans about canoodling with Russians. Team Trump is doing its best to diminish the fact that the man Trump hired to be his go-to man on national security is a felon. We will hear now that the Logan Act, which prohibits civilians (then-citizens Trump, Flynn, Kushner, Sessions) from conducting foreign policy, is no biggie. Never been prosecuted. Mountain out of molehill. That may be true, but that’s not the real crime being investigated here, aside from the crime of obstructing the investigation into the real crime. The real crime is Russia’s providing assistance to the Trump campaign through in-kind services, like stealing information from the opposing party and sharing it with the Trump campaign, seeding social media with fake news and ads, and attempting to cripple or otherwise compromise state elections operations. 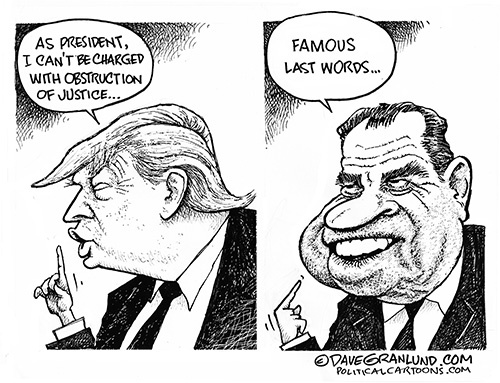 When Richard Nixon was impeached, lies were the reason – the cover-up. But the crime was far more than one iddy, biddy burglary. The Nixon campaign had sponsored a massive program of dirty tricks aimed at undermining his political opponents. What Robert Mueller is investigating is whether Team Trump contracted out – yes, outsourced – the dirty tricks business to foreign friends. We found out years after his departure that Nixon had violated the Logan Act by seeking, before he became president, to slow down peace negotiations in Vietnam so he could take credit for any breakthrough. He may yet enjoy his tax cut, but the lies are catching up to the king of falsehoods. Longtime former Texas newspaperman John Young lives in Colorado.